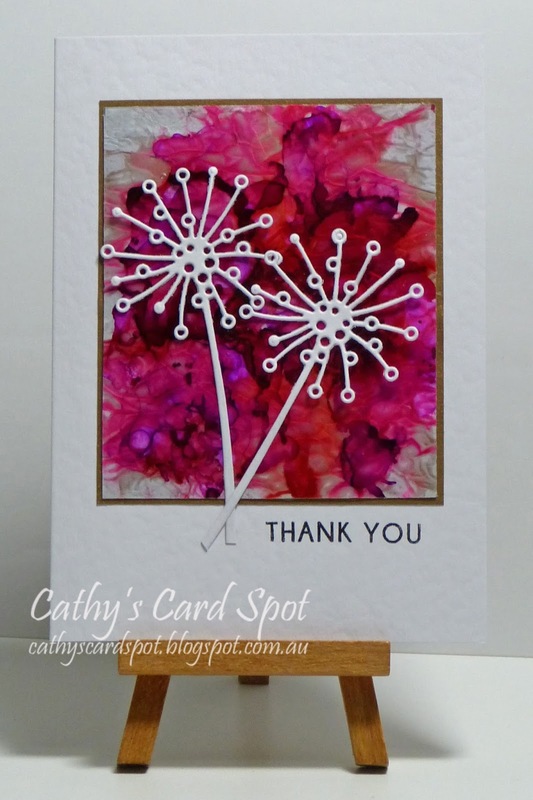 Cathy's Card Spot: Alcohol inks, acetate and diecuts. Hi everyone, I was remiss in linking up this card to the CAS Mix up Challenge! Time got away before I could finish it. In real life the acetate panel looks like a sliced jewel! But when photographed it needed something else! I'm a big fan of Loll's gorgeous CAS cards and she often tops off a beautiful background with a white die cut, so I tried this technique too! Alcohol inks were dripped and blown onto the acetate then I added a layer of dimensional magic glue. A piece of scrunched then flattened tissue paper was stuck onto this to make a white backing. The gold layer of shimmer paper adds more colour in the gaps where the tissue seems to have disappeared and added a frame to balance the white base. Simon Says Stamp Wednesday where the theme is flower frenzy. Work it Wednesday where the theme is to use a fun inking technique. 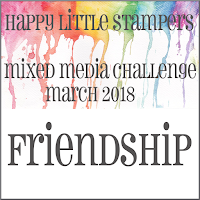 Happy Little Stampers Mixed Media Challenge has a friendship theme. Thanks is an important part of any friendship! Poppystamps has a clean and simple challenge this month. At Addicted to Stamps and More the theme is also clean and simple. At Craft Stamper Magazine Tke it Make it Challenge, it's anything goes as long as you use a stamp somewhere on your project! Alcohol inks; Poppy stamps woodley stem die; acetate; modge podge dimensional magic; white tissue paper; gold shimmer paper; Altenew magnolias for her sentiment stamp; versafine ink & clear ep. The colors are stunning and I love the white die cuts. I need to try this with the alcohol inks. I like how they look on glossy paper but have never tried on acetate. Oh this is lovely, the white and that pop of colour....gorgeous ! Another gorgeous AI acetate card, Cathy! I love the colors you used and the tissue paper texture! Cathy, this card is so very pretty. The colors are definitely jewel-like. It almost reminds me of a geode. So fabulous. Simple stunning!!!!! I love the burst of colour behind the white flowers. Such a pretty card. The techniques result in such an elegant look. This is so stunning! The delicate die cuts and that bold inky background together are amazing!